Ackermann’s Repository of Arts, June 1810. 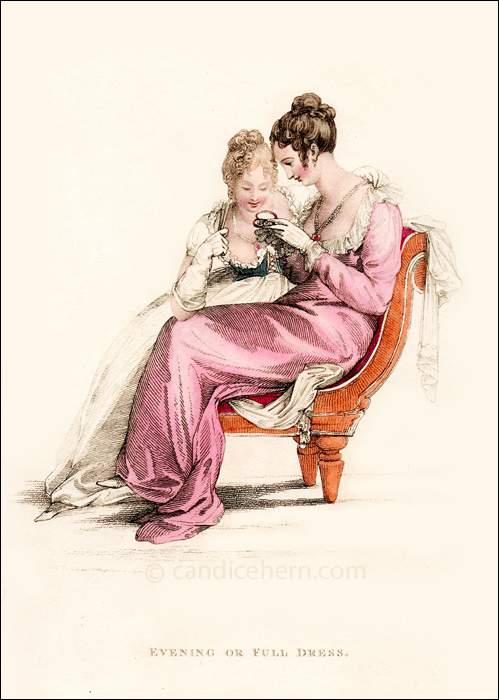 I love this print as it shows two women admiring an encased portrait miniature. Is one showing the other a picture of her sweetheart? 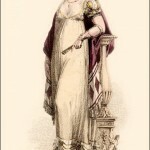 “A round robe, with long sleeves, and demi-traine of white gossamer, or white crape, over a pink satin slip. 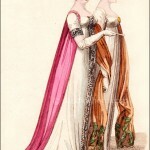 The Maria Louisa pelerine [ie a narrow cape or tippet] of the most delicate French net, trimmed round with broad lace, and confined in the center of the bosom with a broach of pink topaz, set round with brilliants. A deep ruffle at the wrist, of lace similar to the tippet. 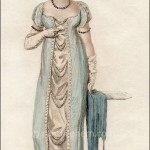 Hair confined from the roots behind, and fastened with a Parisian pin of diamonds, in front, and on the sides, in blended curls and ringlets: a diamond tulip or crescent in front. Necklace ear-rings, and bracelets, to correspond. Roman slippers of white kid, with silver clasps and binding. An occasional scarf or buff or purple silk, with variegated border and ends. Gloves of white French kid, and opera fan of carved ivory.